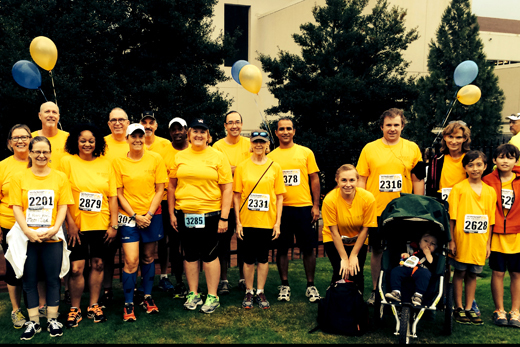 The volunteer Wellness Champion for Library & Information Technology Services organized a group of LITS employees to participate in the Winship 5K in September. Courtesy photo. The most successful employee health and wellness programs are supported by a dynamic network of enthusiastic individuals at the grassroots level. “Wellness Champions” are the drivers for building a culture of health and wellness throughout Emory University and Emory Healthcare. Emory’s volunteer, grassroots Wellness Champion network started in early 2013 with just 15 champions and has since grown to include a total of 44 champions in 37 departments and schools. The network is made up of employees who are vocal, voluntary, grassroots supporters of Emory’s wellness program offerings. The wellness team at the Faculty Staff Assistance Program provides support to the Wellness Champions with monthly conference calls along with knowledge and ideas to help them accomplish their goals. Melissa Morgan, manager of wellness programs, explains that the Wellness Champions are true partners in helping to engage employees at the local level. “They motivate and encourage others to adopt and maintain a healthy lifestyle and help launch and market new and existing wellness programs. They also contribute to a healthy workplace culture by modeling the behaviors that Emory wants to encourage,” she says. Kim Comstock, Wellness Champion for Library & Information Technology Services (LITS), is successfully infusing physical activity into her department. She helped set up regular walking groups, is promoting a self-sustaining Fitbit community group for employees, and organized a group of LITS employees to participate in the Winship 5K last September. A number of Wellness Champions have even established their own local wellness committees in their buildings. For example, Adam Malm of the School of Nursing co-chairs their Task Force for Promoting Optimal Health and Wellness and Lianne Sagorski of Emory Saint Joseph’s Hospital helped create the ESJH Wellness Committee. Emory’s Wellness Champions help to positively influence the Healthy Emory strategic focus areas, which are to increase physical activity; improve healthy eating and nutrition; and enhance stress management skills. For more information on becoming a Wellness Champion at Emory, contact Melissa Morgan, manager of Wellness Programs, at melissa.morgan@emory.edu or 404-727-4328.